Keeping your customers loyal to your brand so you won’t lose them to competitors sounds great but when it comes to an execution, it might not be so fun. There are tons of so-called “driving-loyalty” platforms, apps, and programs that are facing a very basic problem — nobody wants to use them. Well, a Gino Rossi’s app isn’t one of them. Gino Rossi is one of the leading and most valuable Polish brands in the luxury footwear sector. It’s also one of the first Poland-based retailers that implemented beacons in their already successful omnichannel platform (synerise.com). Making it even more successful. Gino Rossi understands that in order to drive customer loyalty towards the brand, a customer must be loyal to a tool first. In other words, he or she has to use it so it must be useful and tailored to their actual needs. Conclusion? Forget about spamming and irrelevant advertisements, or forget about loyalty. If you want your customer to be loyal, treat him or her personally. Focus on their individualities, habits, and interests. Don’t pretend you’re doing so. Be loyal. How loyal is Gino Rossi at that point? Dramatically loyal, you would say. There are no standardized promotions at Gino Rossi. Every offer a customer gets is based on his or her other purchases and is delivered in the right place at the right time. Such an extreme relevance immensely levels up customer experience, builds and maintains relationships, and eventually increases consumer’s willingness to buy. How does proximity help drive customer loyalty? Achieving such a relevance in delivering tailored messages to customers is undoubtedly impressive. Incentives need one more thing to turn impressions into actions, though. They need context. And that’s where beacons come up. In terms of either gathering data about customer’s behavior in a store and providing relevant notification based on that, there is no better and more efficient solution than proximity. In the pilot phase only we collected and analyzed approximately 25.000 data storage entries that allowed us to better understand the brand and its customers. Thanks to Kontakt.io beacons then, we are able to make their relationships as personal and sophisticated as never before. — said Jarosław Królewski, Managing Director at HG Intelligence that developed the entire omnichannel platform (synerise.com). Engagement metrics are a make-or-break factor for any loyalty program. So let’s take a look at them. Are Gino Rossi customers really loyal? 100% loyal, we almost may say. Up to 98.5% of users keep using Gino Rossi app after receiving a notification. Such a retention rate is far more than outstanding — it’s impossible for even most engaging apps you can think of. Not only do customers find ads undisturbing, they also engage with them! 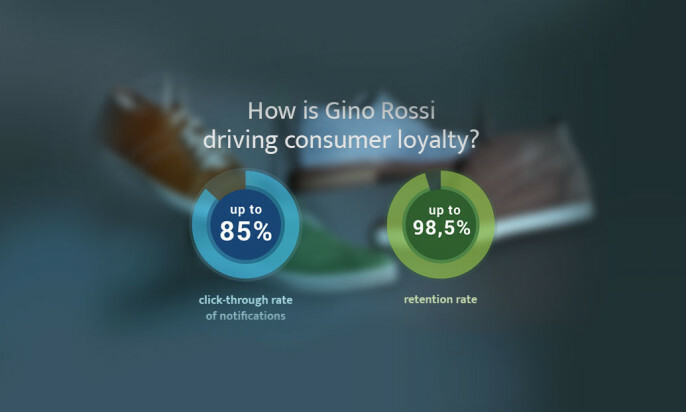 Gino Rossi’s context-aware notifications achieve an astonishing click-through rate of even 85%. If you’re doing maths right now, let us help you. Those results are at least 14 times better than the best CTR for super-relevant and hyper-targeted campaigns in search engines or social media you can imagine. That’s the power of proximity. Don’t believe people who say it’s the end of loyalty programs. Show them it’s the beginning. Develop your own solution and gain new, extremely loyal customers. All you need is the right approach, engaging app, and some reliable beacon hardware.